On average this is the warmest and driest corner of England. the iconic White Cliffs, Canterbury Cathedral, Dickens World, and loads of great beaches for you to choose from. Allhallows have their "Live Lounge" with great entertainment for the whole family to enjoy day and night. A range of fantastic sports and leisure activities, including heated indoor and outdoor pools, sports court with tennis, bowling green, crazy golf and a 9-hole golf course. Kids will be kept entertained for hours at the kids' clubs all ages catered for. And if you're peckish, the Café Bar & Grill offers a delicious range of food in great surroundings. 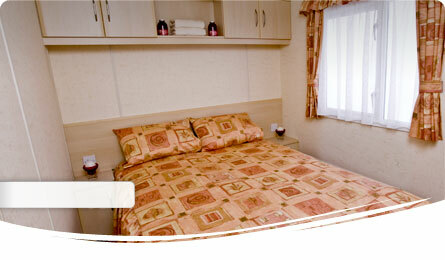 Our Accommodation is an Affordable Basic Unit but promises comfort and everything you need. A great base for your Holiday and your Pet* can even stay too. Located on an elevated spot on the the park. The Entertainment Complex Bar, Cafe etc. are within easy reach. Bookings for Weekend (Fri-Mon) & Midweek Breaks (Mon-Fri) or 1 & 2 nights stays considered*. Please Phone for a Price. ^Subject to a minimum charge equal to weekend break price or £90 (which ever is greater). 3 bedroom caravan sleeping 6/8 people.